The Okazaki Naval Air Group Monument remembers young men from the Air Group who lost their lives in battle including during Kamikaze Special Attack Corps suicide attacks at the Battle of Okinawa. The monument stands in Yanagawase Park, a short walk from Kitano Masuzuka Station. In 1930, the Navy's Hiko Yokaren (Preparatory Flight Training) system was introduced with the objective of early education for gifted individuals. In 1944, the former Yokaren training was reorganized, and a new system was implemented in which trainees learned aircraft maintenance skills and afterward were taught aircraft piloting. In May of the same year, the 1st and 2nd Okazaki Naval Air Groups were established as detachments of Tsuchiura Naval Air Group at the place where the cities of Anjo, Okazaki, and Toyota intersect. Over 12,000 young men, carefully selected from all over the country for the 1st to 8th Classes, completed the Yokaren program shortened to six months and were assigned to operational units in Japan and abroad. The Okazaki Detachment of the Nagoya Naval Air Group was reorganized into the 3rd Okazaki Naval Air Group. Superior aircraft crewmen were trained, and afterward they formed special attack squadrons for Okinawa and were sent into battle. In the final stage of the Pacific War, an unexpectedly large number of men from the Okazaki Naval Air Group who received Yokaren training and flight training here gave their precious lives in battle. As we mourn for those youths who were from 14 years old (like flashes of light) to 19 years old, we erect a monument here and plant these cherry trees in order that they may be long remembered. The cherry trees planted in 1974 around the monument have grown so that it now stands in a grove of trees at the Yanagawase Park grounds. 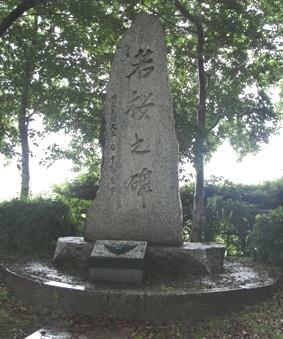 Another monument in remembrance of the Yokaren at Okazaki Air Base is located at Kumano Jinja in Anjo City.